The gifted left-hander finally converts a good innings into something substantial as the hosts dominate Sri Lanka in the rain. 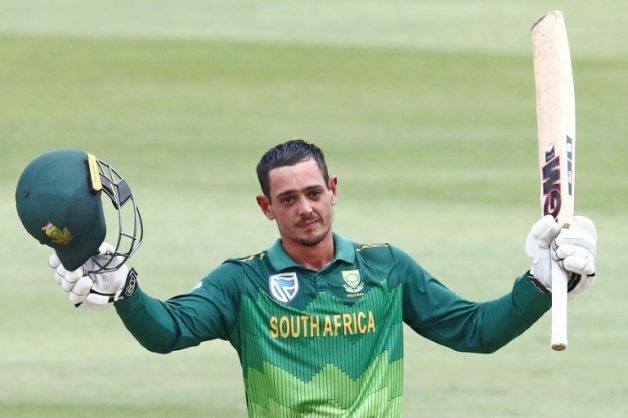 Quinton de Kock is rapidly emerging as the Proteas’ trump card for a full-on tilt at World Cup glory later this year. The supremely gifted left-hander was once again at the heart of his side’s 71-run DLS-calculated victory over Sri Lanka in the third ODI in Durban on Sunday, a match badly disrupted by rain. It means South Africa take an unassailable 3-0 lead in the five-match ODI series and can now attempt to answer a few remaining questions without the pressure of positive results too. Like his effort in Centurion earlier in the week, De Kock dominated the first part of the Proteas’ charge to 331/5. He feasted on Sri Lanka’s poor new-ball bowling and kept up the rate, eventually ending with a supreme 121 off just 108 deliveries. The relief on his face was palpable when he reached three figures as his previous three ODI innings read 94, 81 and 83. He and the whole of the country will hope this purple patch will continue in England in just over two months’ time. South Africa’s middle order capitalised reasonably well on his platform. Rassie van der Dussen crafted yet another half-century, surely cementing his World Cup place, while David Miller (41 off 46) and Dwaine Pretorius (32 off 26) played their parts. However, it was Andile Phehlukwayo that eventually put the game out of Sri Lanka’s reach, showcasing his newfound batting prowess with a brilliant, unbeaten 38 off just 15 balls. Kagiso Rabada’s potent, economical opening spell meant the visitors were never on target. They had seemed to find a bit of rhythm when Oshada Fernando (25) and Kusal Mendis (41) took them to 75/2 after 16 overs. The rain then came and left them with an impossible target of 193 in 24 overs. Predictably, they didn’t even come close, with Imran Tahir enjoying himself with a spell of 2/29 off his five overs.